Read part 1 of "Eighty-three" Read part 2 of "Eighty-three" Read part 3 of "Eighty-three" Read part 4 of "Eighty-three" Read part 5 of "Eighty-three" As the Garfield Cadets headed to DCI Championships at Miami's Orange Bowl in mid-August of 1983, a subdued confidence took over the corps. Corps director George Hopkins had the suspicion the corps would win the DCI trophy "Towards the end (of the summer), when we were like 35-0." Patrick Zampetti: A lot of things can happen over the course of a season but with the design team we had and the improved talent levels in the corps, I would have to say that we always thought from the very beginning that this show could win. Johnny Sanchez: We were pretty relaxed during the week. We felt like we were on a road to destiny. Honestly, I don't think we would have felt differently if we had lost. We had already changed the activity and no one could take that away. It was a very special season. The Garfield Cadets. Photo from the 1983 DCI program book. Brian Wilkie, Sr: We arrived in Hollywood, Fla., in the middle of the day a couple of days before prelims. It was extremely hot as we unloaded the buses into the school. I remember the mood of the corps was very relaxed and light. But there was a definite buzz throughout.^The field we used was just behind the school. Very short, golf course-like grass, but it wasn't the main field of the school. THAT field was nearly perfect - emerald green, flat as a board, nicely lined. We were told we couldn't use it because the football team was concerned we would destroy it. The sprinklers were on it constantly. So we trudged behind it each day to our assigned rehearsal field. And there were no stands at this field. None. So there was no box, no upstairs set-tweaking, no ensemble rehearsal. And it was championship week. But I remember not even being concerned about it. I'm sure behind closed doors Zingali and Sylvester and Twiggs went berserk with George about it, but we never saw it. Only calm. To this day, I can't recall any rehearsal with any group I've been part of since that has gone as smoothly or has been as rewarding. Each was better than the last and they all were perfect. Patrick Zampetti: We reminded ourselves of the collective efforts that had gotten us to that point of the season. We knew that the show deserved our best effort and that we owed it to our fellow Cadets to continue to improve. The show was difficult and even in finals week we would have substantial breakdowns during run-throughs. We never quit and continued to improve right up to our finals performance. Al Chez: The run-throughs the entire week were amazing! The corps was performing the program to the max. Brian Wilkie, Sr: During rehearsals, the entire staff would climb our portable aluminum scaffolding as they had done all season, hanging off of every conceivable spot they could. Zingali and Sylvester would lean off the top, hanging by an arm, one on each side. The podium looked like a jungle gym at a playground, and the staff was just as giddy as third graders watching us. This was not a contrived attempt to pump us up, I'm sure. The looks on their faces were of genuine joy and even surprise at what they were witnessing. Al Chez: I remember the staff being on the scaffold in Miami. There was an air of nervousness. We had broken 90 on August 2, 18 days before finals. We did not want to peak too early. I remember Zingali getting physically sick over the back of the scaffolding. Johnny Sanchez: One night, early in the week, we were outside in a horseshoe during music rehearsal when Warren Corman and I noticed a few older gentlemen watching the rehearsal with tears streaming down their faces. After the rehearsal we went over to talk with them. They had marched in Garfield in the 1930s and didn't even know the corps still existed. They hadn't seen the corps in almost 50 years. It was a simple gift from God to talk with them that night. It made me realize what it meant to be a Garfield Cadet. The thought of that moment still brings tears to my eyes. Despite an undefeated record through the summer, the Cadets tied the Blue Devils for second at semifinals on Friday, Aug. 19, with a score of 91.15. The Santa Clara Vanguard won that show with a score of 91.90. Some say that the continuous chants of "East! East!" altered the corps' ability to hear itself, and others chalked the loss up to "overhype." Brian Wilkie, Sr: Our semifinals performance was extremely emotional. As we came through the back gate, the chants of "East! East!" had already started. Whoever was on the field before us was being ignored by this raucous crowd. It seemed as though the entire state of New Jersey had shown up. As a corps, we were not prepared for this reception. I remember being in my spot to start the show, listening to the crowd thinking, "This is crazy." I'm not sure I agree with the general consenus that we were overhyped. The composition of our show didn't really permit that. Tempo tears would have pulled it apart beyond repair if that were the case. I believe we simply had a slightly off night. The air was very thick and the sound seemed to fall out of the horns into the ground. Zero projection. Visually it felt a little ragged around the edges. Sets did not click completely. For whatever reason, on that night it wasn't meant to be. In retrospect, I think it was best that we got that out of our system in semifinals. Because it reminded us that this was a show that had to be performed completely from start to finish. After this setback, Hopkins and Michael Cesario briefly addressed the corps. Brian Wilkie, Sr: As I recall, after prelims it was Michael Cesario and George that talked to us together, tag-team style. I don't know if George realized how good he was (and still is, as my son will attest to) at making you evaluate yourself. Michael was fantastic at putting things in perspective, keeping things light and making us laugh. Of course, he was, and is, a true visionary in the activity. But in these cases, he was like the fun uncle you look forward to seeing at Thanksgiving. It lasted all of about five minutes. Michael told jokes and George simply reminded us why we started the journey. That it didn't have anything to do with winning. And that, while rewarding, being recognized by 11 judges was not the reason that we did what we did. It was about us. Patrick Zampetti: George kept to his mantra of going out and maximizing personal performance without distraction. We, the staff, kept a confident front and really wanted the kids to enjoy the fruits of their labors, to realize the kind of performance that we had all worked so hard to achieve. The mental commitment to excellence was beginning to take its toll on some of the drummers -- we had to be careful not to lose focus, so I did not push them too hard right before finals. My personal opinion was that we viewed finals as both a completion and shared celebration of the season. We all knew that if the kids performed, the rest would, most likely, fall into place. 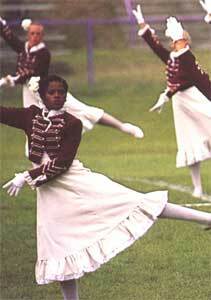 Saturday morning, Aug. 20, 1983, the corps began its last day of the season together. Brian Wilkie, Sr: At the very last rehearsal before finals, every set-to-set we did was nailed. Every one, down to the inch. This is no exaggeration. And it was simply automatic and effortless. It got to the point, where after we all realized what was happening, we all started laughing on the field. It was magical, really. Knowing that we had gotten to this point was simply an amazing feeling. At that point, doing the best we could truly was enough for us. We had lost prelims to SCV by seven-tenths of a point. But no one cared. We just could not perform any better than we were at that moment. The tangible bond between us all that day was extraordinary. If someone was better, it truly would have been fine with us. But we wanted to see it. We had become accustomed to hearing Sylvester and Zingali even on the best days, scream "Again!" at the top of their lungs. Instead, on this day, they were laughing. Zingali was screaming and crying through an ear-to-ear grin, seeing his creation come to fruition, the way he had seen it in his mind, I'm sure. And Donny Van Doren and Jimmer and Hannum were nowhere to be found during these rehearsals. It seemed as though they knew it was not necessary. We had been given everything we needed and this field was not going to yield any new issues with our musicality. The confidence they showed in us by their NOT being there was powerful. They were saying, "It's in your hands. You have all the tools. Now make it happen." The pre-show talk the next night was no different (than the talk the night before after the corps tied for second). No "Ra-ra, do it for the team, we're all family" stuff from any of the staff that night. We knew what we wanted to do that evening, and that was perform with all the emotion that the show deserved. The execution would take care of itself. We saved it all for the field. That evening the Garfield Cadets scored 94.40 to win the DCI World Championship. Brian Wilkie, Sr: It was as if someone put a plea in the newspaper that morning asking our fans to not chant "East" that night as we came on the field. We were all expecting it to be worse than prelims but it wasn't. It was as if everyone in the stadium was nervous for us. As much as everyone had always admired the 27th Lancers, they did not want this to be a repeat of 1980 for THIS eastern corps. And for us, we did not want that for Zingali and Sylvester. They had given us the great honor and privilege of experiencing their genius. Talking to fellow corps members, even years later, it seems as if many of us had the same desire that night -- to give a gift back to our staff for what they had given to us. I remember only a single moment from that performance. Like for many of us from that season, I'm sure, the rest is a blur. But I do remember turning backfield during Barb Moroney's beautiful mellophone solo just after the gun had gone off in the exit and seeing two baritone players, side by side, perfectly dressed in the form, playing, with tears running down their faces. Michael Jones: You have never heard a deafening roar of the crowd like the end of "Rocky Point Holiday" in the Orange Bowl on that hot, hot summer night. We could've stopped right there as far as I was concerned. Scott Litzenberg: I don't think most of us knew what to do -- it was very rewarding and exciting, but most of all a relief. We were very proud of our show and were glad it was recognized as the best. Brian Wilkie, Sr: As we stood on retreat, I recall mentioning to one of my best friends in the horn line during the middle of July after a 3 a.m. bus breakdown that a dream of mine was to be standing on the field at retreat after the scores were announced and be able to walk out away from the corps and look in all directions and not see anything but green. And standing on that field that night, after the scores had been announced, amidst all the tears and hugging, my friend grabbed me and pulled me 10 yards away from the corps and said, "Look, there's no one else here!" Eric Sabach: It was weird, a lot of people around me cried, jumped for joy, were bursting out of their uniforms with a celebratory mood. I took in the crowd. I was eager to do the victory encore and do the show again. I didn't want the season to end. Many of us snuck back into the stadium and sat on the 50-yard line after the show, just to be a group one last time before the morning came and the buses loaded up to head north or people got on their flights to head home from Miami. Patrick Zampetti: I fell to the ground, let out a big yell, and experienced lots of pride and joy for the members of the corps and our shared achievement. It was my seventh year with the Cadets and it had been quite a journey. It was very emotional and it is a memory that I will always have within me. George Hopkins: I found out in the press box -- I was not allowed to let anyone know. We had lost semifinals, so I was happy, relieved, thrilled! The parties on the beach went on all night! And the drive home, the celebration at home. At the time, it felt like a once-in-a-lifetime experience. Who wouldathunk it was just the beginning? Brian Wilkie, Sr.: After we arrived back at the school that night after finals, George talked to us. Contrary to popular belief, (he'll hate me for saying this) he is a very emotional -- reluctant to show it back then, but emotional all the same. After we arrived home, we all received a letter in the mail, handwritten from him.